From cute to ugly—meet marine iguanas | Where to next? You’ve already met the sea lions of the Galapagos Islands, so let’s go from cute and adorable to ugly and prickly—meet the marine iguanas. Charles Darwin thought they were hideous. He saw them everywhere on his travels to the archipelago. He noted that the black lava rocks were frequented by large (2–3 feet in length) disgusting, clumsy lizards. 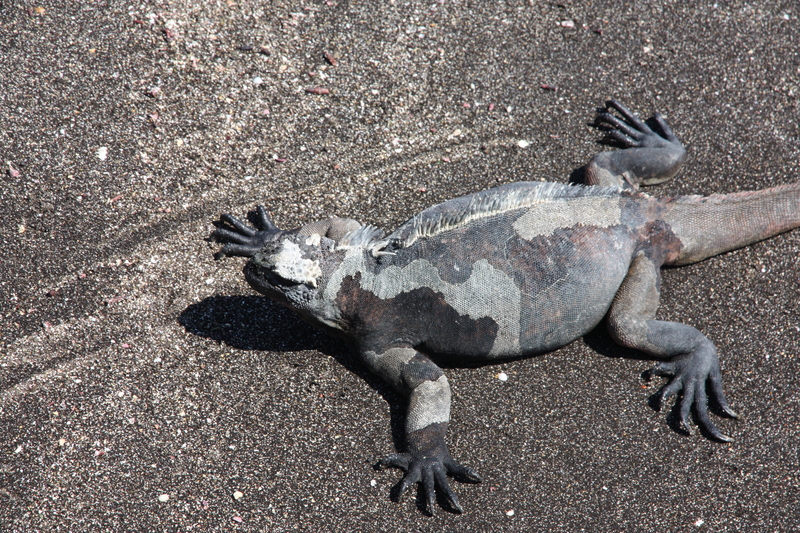 In fact, all marine iguanas aren’t black. We saw many that were multi-coloured with greys, reds, greens, golds and, of course, black. And their ‘prey’ happens to be almost exclusively algae. 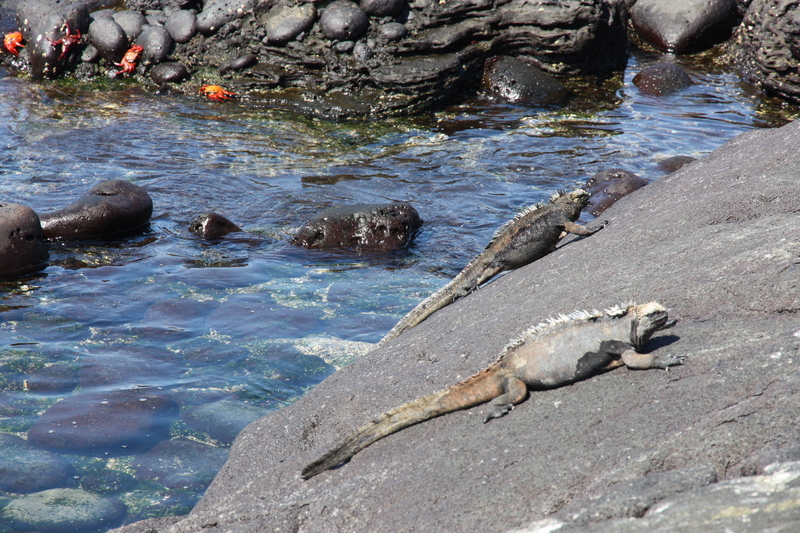 During low tide, iguanas dive up to 10 metres to harvest algae from the underwater rocks. Their flat snout and sharp teeth help them get as much food as possible in the shortest amount of time. Dives can last up to 30 minutes. Then they hurry back to shore to bask on the rocks so they can warm up and begin to digest their food. 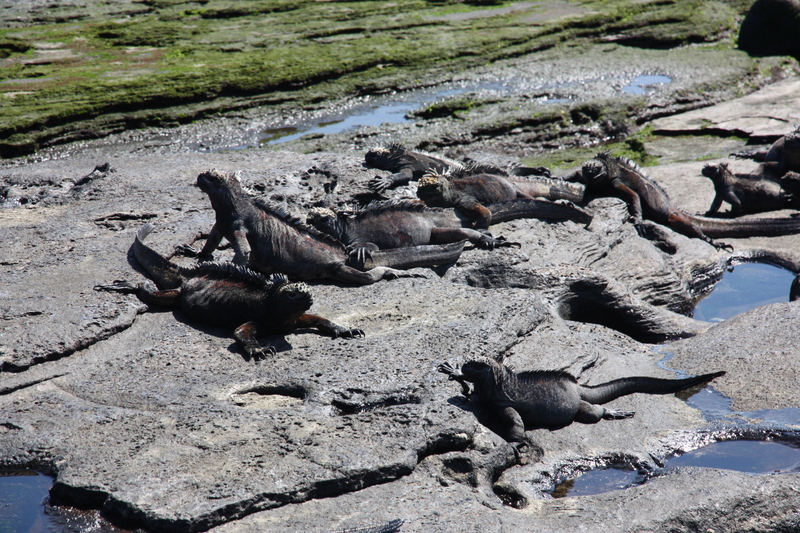 Marine iguanas exist only in the Galapagos—and they are everywhere. The Charles Darwin Research Station reckons there must be hundreds of thousands. We saw hundreds of them—on the rocks, on the sand, swimming back to shore and feeding underwater when we were snorkelling. Apparently they can be aggressive when they are warming up. That’s because they can’t run when they’re cold, so it helps to scare off any predators. Their main issues are with cats and dogs on inhabited islands. One thing I saw just once, but wasn’t quick enough to photograph, was an iguana snorting water out through its nostrils. They have a special gland in their snout that filters their blood for excess salt ingested while feeding. Later they ‘sneeze’ out the salt. So who should I introduce next? I still have the boat, crabs, birds, lizards and more to go. Stay tuned. Certainly not an attractive species Peggy! I’d like to see the boat next please. And do you know why the sand is red? How warm is it? It certainly looks very nice especially if you’re able to snorkel. Just posted about the boat. Will write about the sand soon. Off to bed now. Meet the sea lions of the Galapagos Islands « Where to next?